The most recognized of Lisbon's major attractions, St. George's Castle commands a glorious position near Alfama on the crown of a hill overlooking the Portuguese capital. 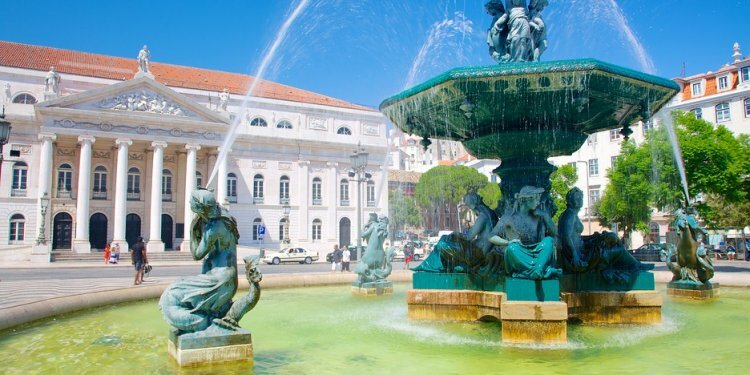 This is one of Lisbon's most popular tourist destinations. Its impressive battlements, engaging museum, and fascinating archaeological site combine to make the castle a rewarding experience for the whole family, and kids especially will love clambering over the sturdy walls and towers that encircle the grounds. There's been a stronghold on this site since the Iron Age, but it was a castle that the Moors defended against invading Christian forces before finally being overrun in 1147 by Afonso Henriques. The victorious king built the Aláçova Palace, home to subsequent monarchs until a new royal residence was constructed near the river. (The palace foundations form part of the excavations seen today.) For the most part, visitors are happy enough to admire the fabulous views from the observation terrace that affords an uninterrupted panorama of the city, the River Tagus, and the distant Atlantic Ocean. For a different perspective, there's a Camera Obscura periscope housed in one of the towers that provides viewers with an unusual 360° projected view of the city below. A highlight of any Lisbon sightseeing tour, the 16th-century Jerónimos monastery is one of the great landmarks of Portugal, a stunning monument of immense historic and cultural significance deserving of its UNESCO World Heritage Site accolade. Near the riverfront in Lisbon's attractive Belém neighborhood, the monastery, also known as the Hieronymite convent, was commissioned by King Manuel I in 1501. Built to honor Vasco da Gama's epic 1498 voyage to India, Jerónimos is as much a symbol of the wealth of the Age of Discovery as it is a house of worship (construction was mostly funded by trade in the spices brought back by da Gama). Star features include the fantastically elaborate south portal and the beautiful and serene Manueline cloister. Vasco da Gama's tomb lies just inside the entrance to Santa Maria church. The Lisbon Oceanarium is one of Europe's finest aquariums, and one of the largest in the world. It's also arguably the most family-orientated of all the city's visitor attractions. Designed by Peter Chermayeff and built for the Expo 98 World Exposition in an area now known as Parque das Nações, the oceanarium is home to a mind-boggling array of fish and marine animals, including dozens of different species of birds. The ingenious layout represents four separate sea- and landscapes, effectively the habitats of the Atlantic, Pacific, Indian, and Antarctic oceans. These surround an enormous central tank teeming with fish of all shapes and sizes including graceful rays, bulbous sunfish and sleek sharks - kids' favorite denizen of the deep. The wraparound plexiglass allows a fantastic close-up view of this magical undersea world, but you should also seek out less obvious, but no less extraordinary species housed in smaller aquaria such as the exquisitely delicate sea dragon and the comic clownfish. The different ecosystems are a delight to explore. The Antarctic habitat, for example, showcases playful penguins, while a pair of spirited sea otters steals the show in the Pacific tank. The Oceanário de Lisboa actively promotes conservation of the world's oceans, and besides its envious reputation as one of Portugal's most popular tourist attractions, has garnered global praise for its marine environmental awareness campaigns. But most of all, it's seriously good fun. A sparkling gem in Lisbon's cultural crown, the Museu Calouste Gulbenkian is also one of the most celebrated museums in Europe. The facility, sited in a lush, verdant park in the north of the city, is named after Calouste Sarkis Gulbenkian, an Armenian oil magnate born in 1869 who bequeathed his vast private art collection to Portugal shortly before his death in 1955. Following the terms of this endowment a foundation was created, the centerpiece of which is this purpose-built arts complex. Gulbenkian's astonishing hoard features priceless artworks from around the world, which span 4000 years, from ancient Egyptian times to the late 20th century. With so many pieces from so many different periods in history to absorb, you can easily spend half a day browsing the exhibition galleries, but your patience will be rewarded with a mesmerizing journey through one of the finest collections of art on the continent. Outstanding highlights in the Classical and Oriental Art galleries include 11 Roman medallions, part of a hoard unearthed in Abu Qir, in Egypt, struck to commemorate the Olympic games held in Macedonia in AD 242. The 17th-century Persian and Turkish carpets on display are some of the best preserved in the world and clear evidence of Gulbenkian's keen interest in Islamic art. Move through to the European Art (14th-17th centuries) and among the Rembrandts, Van Dycks, and other masters is Portrait of Hélène Fourment (c.1630) by Rubens - Gulbenkian's favorite painting. Amazingly, the rare clocks and timepieces displayed in the French 18th-century Decorative Arts hall are all in perfect working order: arrive on the hour and hear them chime. While here, cast your eyes over the armchair that once belonged to Marie Antoinette. More painting and sculpture from the 18th and 19th centuries, where Turner's vivid and dramatic The Wreck of a Transport Ship (1810) holds the eye, can be admired as you move through the building. One room is dedicated to Francesco Guardi and his studies of Venice. Look out, too, for Houdan's graceful Diana, sculpted in 1780. The tour of the museum ends with the fantastic collection of jewelry and glassware crafted by French Art Nouveau jeweler, René Lalique (1860-1945). None of the brooches and necklaces were ever used, except for the startling and flamboyant Dragonfly woman corsage ornament, worn once onstage by actress Sarah Bernhardt (1844- 1923).